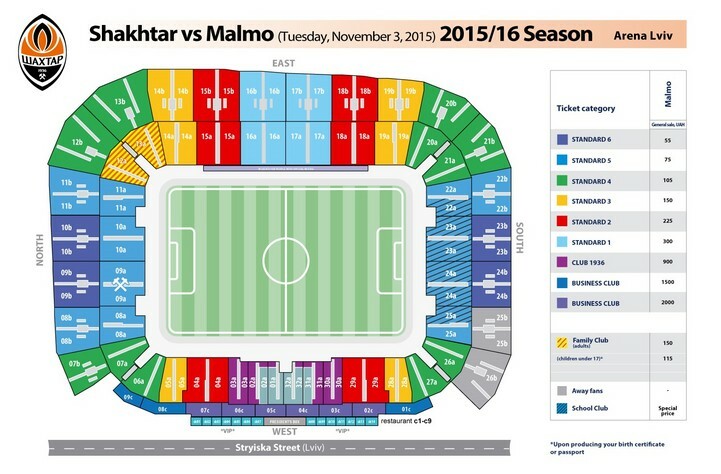 October 3 will see the start of ticket sales for the match of Champions League group stage between Shakhtar and Malmo. The game will take place on November 3, Arena Lviv: one fan will be able to buy a maximum of four tickets per customer! The Arena Lviv ticket offices are open from 10:00 to 20:00 daily. During holidays and weekends schedule will not change! When buying tickets, one must show ID and fill out a form. The winners of the ‘Waiting list’ will be able to purchase tickets online from 5 October. Each fan will receive a text message and an email with detailed instructions regarding the purchase. Fans, who want to buy VIP-category tickets for the match Shakhtar vs Malmo, will soon be able to buy tickets for the home match against Real Madrid - in the same category and for the same sum of money. You can book tickets and get additional information by calling (067) 620 14 59. We remind you that the fans have the opportunity to book corporate boxes for the Champions League games. You can order them by calling (067) 620 40 11. Our site will additionally inform you about the start of ticket sales for the Shakhtar vs Real Madrid match. Follow the news.